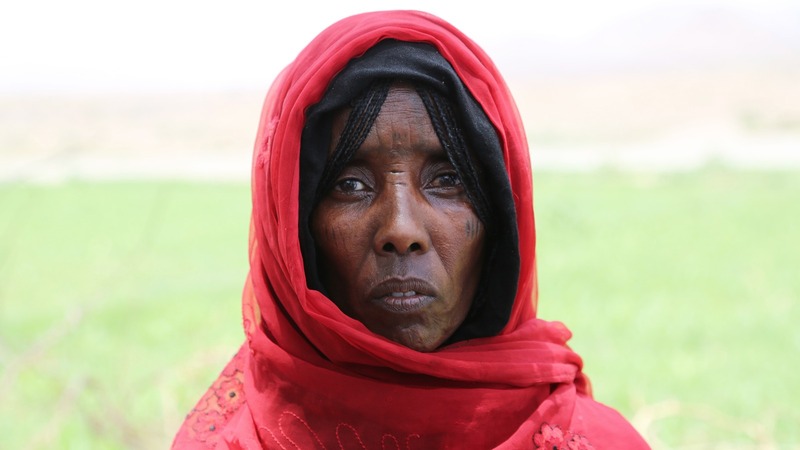 Firmly attached to her home region and long used to the harshness of her living conditions, Amina Aliyu would probably not see herself as a potential “climate change refugee”. But there is a strong probability that in 10 or 15 years the place where she lives will no longer be fit for human habitation and migration to another region, or even another country, will be the only option. 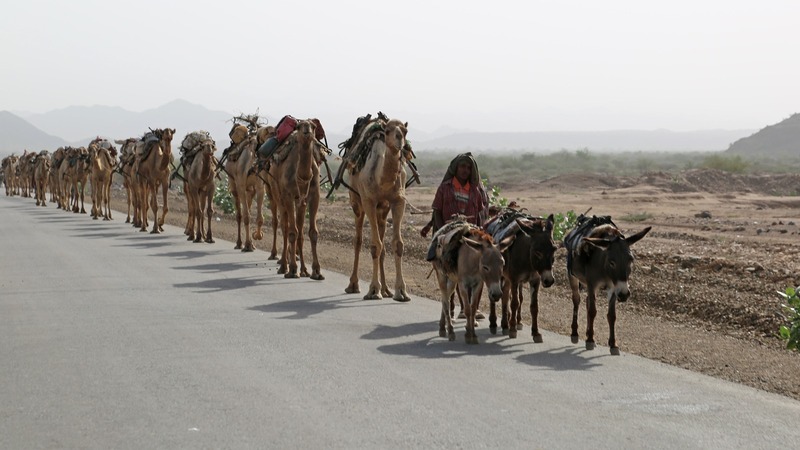 Home for Amina is the village of Sebana-Demale, just 60 km from the Danakil depression in north-eastern Ethiopia. This is one of the lowest places in altitude and one of the hottest in anywhere on the planet, with temperatures of 40 degrees Celsius or more, all year round. Aliyu’s own village lies in a volcanic region described as one the harshest in Africa and often likened to a lunar landscape. There is a small river, the Demale, running through the village. Local residents, from the Afar people, with a long history as resourceful pastoralists, have tried in recent years to take up farming around the river. But not all families have access to motor pumps to draw water from the river when the depth of the water is low. Aliyu has neither livestock nor the means to get food from the land. She lives off food aid and knows breaking out of that dependency will be difficult. But if living conditions become even less sustainable, Aliyu will face difficult options: to stay in the hope of finding new ways of generating income or receiving more external help; moving to another part of the region, or moving even further away and risking the loss of her coveted ancestral and cultural ties. Cases like that of Aliyu are of obvious interest to the Nansen Initiative, which was set up by the Governments of Switzerland and Norway in October 2012. The Nansen Initiative seeks to develop “a protection agenda addressing the needs of people displaced across international borders by natural hazards, including the effects of climate change”. The Nansen Initiative works on the premise that climate change and migration need to be looked at together. Climate change will mean larger populations being challenged by both sudden-onset disasters and slow-onset disasters in the future. The Nansen Initiative argues that current planning mechanisms on climate change, both national and international, are insufficient. The body argues for more effective early warning for extreme climatic events, better water management and more sustained efforts to reduce pressure on fragile environments. The Nansen Initiative particularly highlights the need for the protection of affected populations. In a joint policy brief with the UN University, Integrating Human Mobility Issues Within National Adaptation Plans, the Nansen Initiative highlights the need to integrate the idea of mobility and plan for it, rather than wait for people to flee. "They look also at the migration of affected populations to new countries, including relocation in the industrialised world and the employment possibilities that might be available"
The brief outlines obvious priorities. These include: putting human mobility at the heart of regional climate change and disaster risk management; identifying mobility and climate change in individual countries; helping countries design policies on migration, and ensuring affected communities are involved in any planning for their relocation and that resettlement leads to an improvement rather than a deterioration of living standards. National Adaptation Programmes (NAPs) are identified as the key mechanism whether in preventing unnecessary migration or in seeing migration as an adaptation strategy. What turns “resilient” into “vulnerable”? At present, the Nansen Initiative has five (sub-) regional consultations underway in regions most affected by natural hazards and climate change. The findings will be used at a global consultative meeting planned for 2015, where government representatives and experts will discuss the protection agenda for cross-border displacement. The International Organization for Migration (IOM) has already developed guidelines for integrating migration into the National Adaptation Planning process, notes the brief. It will be producing a module on migration and adaptation and will pilot test it in six countries in 2015. The solutions on migration and climate change being proposed go beyond reinforcing planning mechanisms for countries facing natural disasters; they look also at the migration of affected populations to new countries, including relocation in the industrialised world and the employment possibilities that might be available. The Nansen Initiative looks at how states hosting migrants can provide a framework that “allows them to help their families with remittances so that they may stay on”. Part of the role for those states is providing professional training and sensitization programmes and facilitating permanent migration. Some developed countries, like the United States, do provide Temporary Protected Status (TPS) to nationals from certain countries when there is evidence of extraordinary events and conditions taking place. These could include an ongoing armed conflict, such as a civil war, or an environmental crisis, such as an earthquake or hurricane, or an epidemic, events which could prevent migrants in the US from returning home. The TPS allows migrants from those countries to work temporarily in the US and remit their earnings. Since the 1990s, TPS has been granted in a number of cases, including Hurricane Mitch in Central America in 1998 where nationals of Nicaragua and Honduras were granted TPS. Earthquakes in El Salvador (2001) and Haiti (2010) led to those countries being accorded the same status. Koko Warner, head of the Environmental Migration, Social Vulnerability and Adaptation Section at the UNU and one of the lead authors of the new brief, says the TPS is useful as far as it goes. “TPS is a way that some industrialized countries have chosen to manage the practical challenges of addressing human mobility (migration, displacement) in a context where the ‘normal’ policy frameworks to manage labour-related immigration and persecution-related fleeing (refugees) do not really apply,” Warner argues.